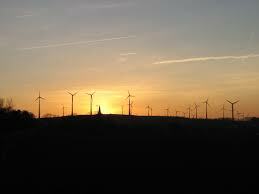 Dardesheim counts merely 3,779 (2015) inhabitants, but has been pioneering the use of renewable energy sources in Germany since one of the first wind turbines was erected in Saxony-Anhalt back in 1993. The nearby hill “Druiberg” offered the ideal conditions for wind power and Dardesheim quickly attracted private investors. In 1994, an agreement with a wind turbine company laid the foundation for further expanding the wind park. Fifteen years later in 2009, Dardesheim produced ten times of its overall energy demand with renewable energy. By today, the Druiberg is covered with 32 wind turbines with a total wind power capacity of 68,9 MW, which is equivalent to about forty times the total annual electricity consumption of Dardesheim or 15 times the overall energy demand, including electricity, heating or cooling and fuel for transportation. Until 2017, seven additional wind turbines and a battery storage system are planned to be added to the system. The latter is of particular importance to become less dependent on varying wind conditions. Besides wind power, nine solar power plants produce one third of Dardesheim’s electricity demand since 2005. Furthermore, private solar collectors are providing warm water and there are several biomass-based heating systems in town. The transition towards renewable energy is also tackled in the transportation sector. In 2005, two local car companies started to offer the exchange of diesel-fuel driven engines with biodiesel from domestically grown rapeseed oil. The Druiberg wind park is leading by example also running its cars on biodiesel. Near the town hall, a plug-in station for electric cars was constructed and the testing of their usability started with two different vehicles in 2009. Throughout the process of achieving energy autarky and becoming independent from fossil-fuel based energy sources, Dardesheim could always rely on the support and commitment of the local community. This can be attributed to the success and economic benefits resulting from the transition, but also to the transparency accompanying the overall process. For instance, the bimonthly published info sheet ”Dardesheimer Windblatt” is delivered to every household free of charge, providing everyone with the latest developments on the Dardesheim energy project. The success story of Dardesheim is also attracting visitors to the energy self-sufficient town. The wind park is regularly offering guided tours, which, aside from tourists, have been attended by politicians from the regional and national level, as well as schools, kindergartens, citizens and various associations. Nevertheless achieving energy autarky back in 2009, Dardesheim continued its pioneering role. It for instance increased its energy-efficiency through replacing and modernising its street lightning in 2015 with LED systems. Most importantly, however, it aimed for an energy-independent county in 2015 in the context of the Renewable Model Region Harz (RegModHarz), which could soon provide the whole Harz region, populated by 250,000 inhabitants, with renewable energy from solar, wind, water and biomass.